8:30 a.m. - 5:00 p.m. EST. 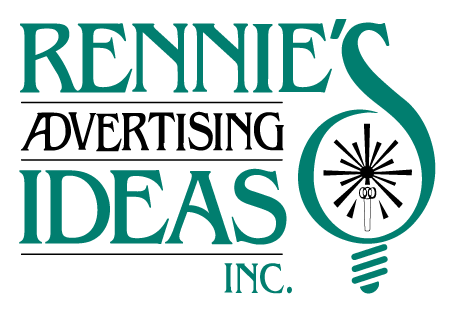 Rennie's provides exceptional personalized service with the goal of helping you with the best in imprinted promotional products, executive gifts and sales promotions. Their clientele includes both small and large businesses in every conceivable classification. While the majority of their clientele is in Richmond, they also have accounts throughout Virginia and the U.S. Founded in Richmond, VA in 1956 by C. Bruce Rennie, Jr. Ownership was transferred to his daughter Alice R. Clark upon his death in 1981. Now in its third generation, Fred Clark serves as President. Alice is responsible for forecasting, planning, management and sales. Within the promotional products industry she was the first recipient in Virginia of the Master Advertising Specialist (MAS). She was founder of the Mid-Atlantic Promotional Products Association (MAPPA) and in 2010 was inducted into the MAPPA Hall of Fame. In the community she was a member of the Board of Directors of the Greater Richmond Chamber of Commerce and received the Bernard Savage Award in 2007. She is very active in her church, St. Gabriel Catholic Church, in Chesterfield. In 1995 Frederic A. Clark, III, Alice Clark's son entered the business as head of the graphics arts department. His role also includes technology, marketing and sales. Fred has earned the Certified Advertising Specialist (CAS). He is the recipient of the "40 Under 40" award presented by Richmond Business Journal in 2001. He is the past president of the Richmond Jaycees for which he was a winner of the Sidney D. Peck Award. Shirley joined Rennie's in 1996. Her responsibilities include customer service, order entry, accounts payable and accounts receivable. She is very knowledgeable of promotional products.